Harriet O’Brien finds a surprising history among the lemon trees and chocolate shops of the Sicilian city. The tangy aroma of lemons hung in the air as we gazed over a panorama of churches and rooftops. From the cliffside garden of the town’s philosopher Tommaso Campailla, the best outlook in Modica lay before us. Signor Migliore smiled and reached into a burgeoning citrus tree. This, he said, as he presented a lemon to me, is a small souvenir of the town – and of Sicily. He nodded and then headed back indoors, where we continued our talk about syphilis. As the curator and owner of the house of Tommaso Campailla, Signor Migliore knows a thing or two about syphilis, along with early 18th-century thinking. Born in Modica in 1668, Campailla was an aristocrat who left home to train as a lawyer, returned, and then rarely set foot beyond the dramatically sited house where he was born. There he taught himself astronomy and philosophy, wrote poetry, corresponded with the great and the good, and came to be held in such high regard that the Anglo-Irish scholar and bishop George Berkeley made a trip to meet him. As something of a sideline he also devised a treatment for syphilis – although Signor Migliore was fairly sure that Campailla never suffered from the disease himself. Any thoughts of maladies, medical history or philosophy had been far from my mind when I had set out that morning from my hotel by the coast of south-east Sicily. I had heard of the Baroque beauty of Modica, about half an hour’s drive inland, and had anticipated spending a pleasant day wandering its theatrical-looking streets, exploring churches – and browsing chocolate shops. For the town is famous for its production of chocolate made more or less to Aztec traditions – the method and raw materials were brought to the island by the Spanish towards the end of the 16th century. Like other towns in Sicily’s rugged Val di Noto, Modica was all but destroyed during a momentous earthquake in 1693. And like the other towns in the area, it was rapidly rebuilt in the flamboyant architectural style of the time, the result so striking that it is now a World Heritage Site. So evidently there’s a wealth to see. But where to start? Happily, one of the managers at my hotel was a Modica man. 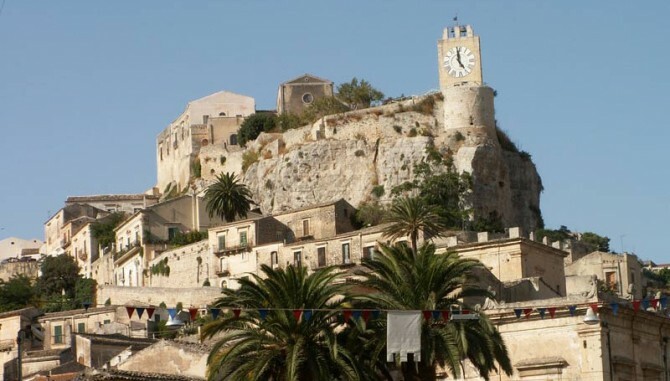 He explained how his native town is sharply divided: there are many churches, he said, but two evoke deep-seated passion – if you come from Modica you are affiliated either with San Pietro in the lower town or San Giorgio up on the hill above. They could be the focal points of my trip, he suggested. First stop was the monumental San Pietro, its ochre-stone façade complete with curvy embellishments, its interior a calming space of white stucco. By contrast, just off the back of the building there’s a treat of a little church turned museum: San Nicolo Inferiore was hewn out of the rock face here centuries ago and, in the course of time and earthquakes, became buried. It was rediscovered by chance in 1987. Together with its 12th-century Byzantine-style wall paintings, it remains only partially restored so it exudes a romantically haunting sense of the past. Next on the agenda: chocolate. A few steps down an alley opposite San Pietro is Modica’s oldest chocolate shop. Antica Dolceria Bonajuto is a delightfully creaky place, its wood-panelled walls lined with displays of production techniques – the sugar they add to the cocoa never fully melts and so the natural bitterness of the chocolate is only partially offset by a sweet crunch. Fortified by a sample of Bonajuto’s chilli chocolate, I set off for Modica’s upper town and the church of San Giorgio. It was a short walk from San Pietro, zigzagging up stairs and strolling through terrace gardens. Fabulously opulent, San Giorgio left me breathless in every sense. Its four-storey belfry presents a great play of curves, pillars and pediments. Its interior is elegantly restrained, the central feature a great altarpiece depicting scenes from the lives of saints Giorgio and Ippolito. Aiming for a panoramic viewpoint I continued upwards and found myself in a maze of lanes bearing little relation to those shown on my map. Finally I followed a road back to the lower town, passing Modica’s medical museum. The map announced that this was once a centre for the treatment for syphilis, which sounded intriguing, so in I went. In pride of place in the museum are the treatment booths Tommaso Campailla devised to “cure” this widespread disease. Patients would sit inside these wooden cabins and inhale infusions of mercury, causing them to sweat profusely. Did this really have any effect on syphilis? The museum’s receptionist smiled and shrugged. Perhaps I should visit the house where the creator of the booths lived. She pointed back up the hill. Two hours later I left Modica clutching a lemon, my head filled with images of syphilis treatment cabins, swirling architecture – and superb views.